Mortise locks are used in student housing and a number of apartment buildings. A flat box deadbolt design, the lock fits into a recessed door that includes two faceplates. The lock has a pin tumbler mechanism which can be operated from either side except when the door is locked. It operates by turning the inside knob, or through the use of a key from the outside. These type of locks are used for inner doors of residential facilities. These locks are ADA accessible and are much easier to grab than a knob lock. The handles on these are push-down and can accommodate both left and right hand installation. Knob locks can be found on exterior doors, coupled with deadbolt locks for added security within a facility. They are very simple and promote ease-of-use. This type of lock has a rim cylinder on one side of the lock and a surface mount latch on the other side. These locks can be set to auto lock and are popular in residential facilities. 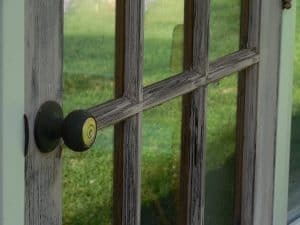 When used for an external door, they are coupled with a deadbolt lock. Are there other types of locks that are used among these types of facilities? Privacy locksets are used within interior rooms. 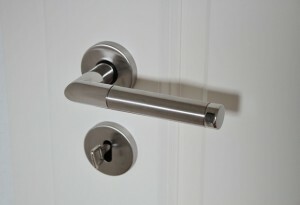 These types of locks have locking buttons on the inside knob, but no key is usually needed, as they are used in restroom and bedrooms that have multiple accessibility needs. These types of locksets are used with knobs or levers and can be easily opened from the outside with a slim object in cases of emergency. Depending on the accessibility needs, an entry lockset is widely used for residential and living facilities. This encompasses two doorknobs that can be locked from both sides. There are a number of different models of this type door lock, which includes locking from the inside while an outside key must be used to unlock, keyed locking mechanisms on both sides of the lock, and instances where an inside knob locks and unlocks both sides. Handle sets are another type of lock that is an entry set with a combination deadbolt and knob which can be a one or two piece unit. These can be used with single and double-cylinder deadbolt styles. Surface-mounted deadbolts are very stylish door locks that are square in shape and mounted inside the door which can be turned with either a turn knob lock mechanism, or a key. Knowing the amount of use and foot traffic that will access the locks is also a factor. Being able to provide the best security options while meeting the needs of the facility and the resident is key. Is there a grading system for locks? Grade 1 locks are the best and can be considered the highest grade security available. These locks meet all commercial building standards and can also be used in residential facilities through deadbolt locks. Locks that meet ANSI Grade 1 include commercial lever handles, but do not include standard knobs, mortise locks, or handle sets. Grade 2 locks can also meet light commercial building standards and exceed standard residential security protocols. Grade 3 locks are considered good. They provide minimal residential security, but do meet residential building requirements. As a commercial entity, knowing what locks will provide the most protection and safety-enhanced condition for residents is important. For more information on residential locks and tips on choosing the best options for your facility, contact an associate at Great Valley Lockshop today by calling (610) 644-5334, sending an email to [email protected] or through our contact form!